Wolves runner Mirelle Martens is a Pan Am gold medalist. 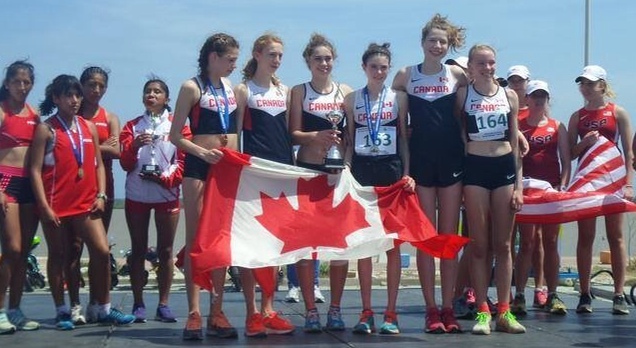 Martens and her Team Canada Junior Women’s teammates won a close three-way battle with the United States and Peru on Sunday at the Pan American Cup Cross Country Running Championships in Barranquilla, Colombia. Individually, Martens placed 24th in the flat 5 km race, recording a time of 18:00. The top Canadians were Hannah Woodhouse (2nd) and Branna MacDougall (3rd). In the Senior Women’s 6 km race, former Wolves runner Fiona Benson placed 13th. Canada’s Senior Women’s team finished second behind the United States. In the men’s races, the Canadian Juniors placed second, while the Senior Men were fourth. Martens and Team Canada will contest the IAAF World Cross Country Running Championships in China next month. This entry was posted in Cross Country and tagged Athletics Canada, Cross Country Running, Fiona Benson, GPRC Wolves X-C Running, Grande Prairie, mirelle martens, Pan American Cup Cross Country Running, Wolves Athletics Club, Wolves Cross Country Running. Bookmark the permalink.